SAN DIEGO, CA, December 10, 2014 – The Port of San Diego announced its role as the first demonstration site in a series of regional public-private smart building initiatives led by local trade association Cleantech San Diego and a team of Internet of Things (IoT) technology providers to advance the region’s smart city goals. The term “IoT” refers to intelligent machine-to-machine applications that use smart sensors to collect information from devices and systems to increase overall automation and efficiency. As urban populations continue to grow, cities around the globe are looking to new technologies to help manage resources in a more sustainable and cost-effective manner. Combining end-to-end IoT gateway solutions provided by Intel Corporation, OSIsoft, Black & Veatch, Dell, and San Diego Gas & Electric (SDG&E), this smart building project uses sensors to detect energy consumption and translate it into easy-to-manage, real-time data for building operators at the Port of San Diego to act upon. “We sincerely thank each of these companies for the expertise and equipment they have donated to launch this first important step,” said Chairman of the Board of Port Commissioners Bob Nelson. 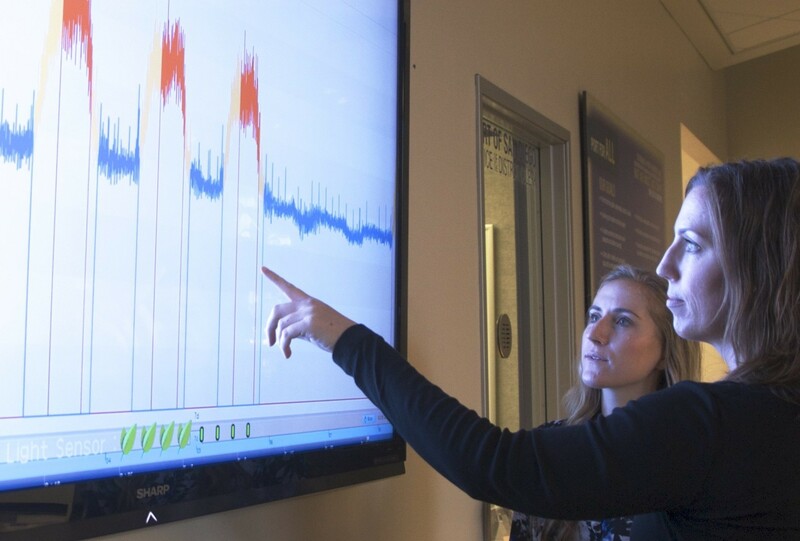 This increased demand-response capability allows Port building operators to analyze energy use patterns throughout the facility, identify abnormalities, and adjust behaviors accordingly, which is expected to result in energy savings, cost savings, and reduced greenhouse gas emissions. The Port of San Diego was among the first ports in the nation to adopt a Climate Action Plan (CAP) in 2013. The CAP provides a long-term strategic vision for the Green Port Program, and calls for 10 percent reductions of all greenhouse gas emissions by 2020 and 25 percent by 2035 compared to 2006 numbers. Recent information shows the Port has made significant progress towards its 2020 goal, reducing approximately 56,000 metric tons of greenhouse gas emissions and achieving over 50% of the 2020 goal. The use of smart sensors to detect and stop wasted energy in buildings supports the goals of the Port’s CAP and is anticipated to contribute to future declines in greenhouse gas emissions. How the smart building project works: Operating on a Dell platform, Intel Gateway Solutions for Internet of Things collect data from heating, ventilation, and air conditioning (HVAC) systems at the Port of San Diego’s Administration Building. That data is then stored in OSIsoft’s cloud-based PI System and translated by Black & Veatch’s ASSET360 analytics software into a simple dashboard display that can be easily interpreted and acted upon by building operations managers. The data is also read by SDG&E smart meters, which allow for two-way communication between the building and the utility. Data from the Port’s Administration Building has been flowing through the new system since early October 2014 and is being publicly displayed on an 80-inch dashboard monitor located in the lobby of the Port administration building. Technology providers involved in the Port’s smart building project donated the hardware, software, and services to the Port in support of the region’s smart city leadership goals. The objectives of this collaboration are to demonstrate how the capture and use of data can reduce energy and save money and to encourage similar deployments in buildings and communities throughout the region. The iconic U.S. Grant Hotel in downtown San Diego is the second site to have installed IoT sensors for similar energy efficiency monitoring as part the regional smart building initiative. Installations have begun and initial results of that deployment are expected later this month. These smart building projects are part of the Smart City San Diego Regional Collaborative, led by Cleantech San Diego, which brings together public, private, and academic stakeholders to drive existing energy programs forward, identify new opportunities, embrace additional collaborators, and move the San Diego region into new horizons of sustainability. The primary goal of the regional initiative is to initiate energy efficiency pilot programs and share those successes and best practices with the goal of having them replicated across the region, the nation, and the globe. As strong supporters of San Diego’s regional smart city initiatives, Mayor Faulconer and Port Chairman Nelson will speak at the Smart Cities Now conference being held Dec. 9-10 in San Diego by the Smart Cities Council and Qualcomm. Also on the agenda are leaders from Cleantech San Diego, SDG&E, OSIsoft, and Black & Veatch. The Port of San Diego is a unified district encompassing five member cities surrounding San Diego Bay. A public agency, the Port is charged by the State of California with developing the tidelands and commercial business as steward of the public-trust tidelands along 34 miles of San Diego Bay. The Port shares the waterfront with the Navy, which oversees 17 miles of San Diego Bay. Cleantech San Diego is a nonprofit member organization that positions the greater San Diego region, including Imperial County and Baja California, as a global leader in the cleantech economy. The organization achieves this by fostering collaborations across the private-public-academic landscape, leading advocacy efforts to promote cleantech priorities, and encouraging investment in the San Diego region. Cleantech San Diego’s membership includes more than 100 local businesses, universities, governments, and nonprofits committed to advancing sustainable solutions for the benefit of the economy and the environment. Smart City San Diego is a regional Cleantech San Diego program in collaboration with San Diego Gas & Electric (SDG&E), City of San Diego, GE, UC San Diego, and Cleantech San Diego. The program aims to drive projects forward that improve the region’s energy independence, reduce greenhouse gas emissions, and assert the San Diego region as a clean energy leader.